Stella Village is a family-friendly property in Analipsi located on a private sandy beach just 3km from the lively resort of Hersonissos. 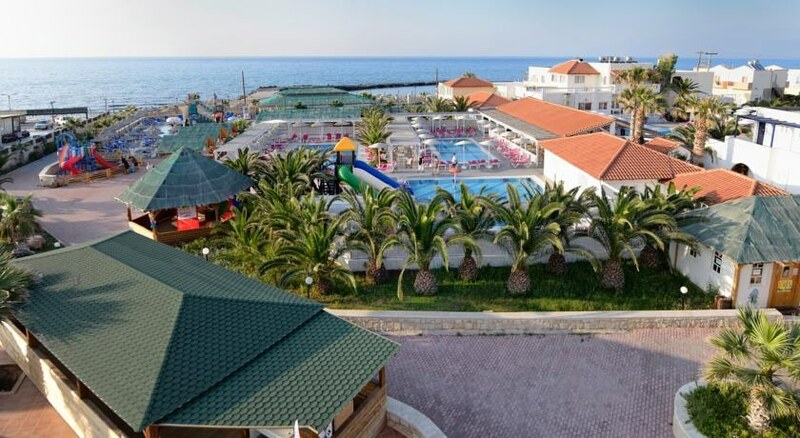 Featuring two large swimming pools for adults, a pool bar, three fabulous restaurants this hotel welcomes guests into a relaxing retreat amidst all modern amenities and warm hospitality for a fun-filled family holiday at Analipsi. Surrounded by beautiful gardens well-appointed guest rooms at this resort come with air-conditioning, fridge, furniture, safe deposit boxes, satellite TV and en-suite bathrooms. The all new Spa center at Stella Palace provides revitalizing treatments to guests amidst serene surroundings and is equipped with an indoor swimming pool, Jacuzzi or sauna and hammam. There is free private parking on site and good taverns and shops are just a few minutes’ walk away. The Stella Palace is located 20km east of Heraklion. The beach is lovely and sandy is named after abundant with olive groves. 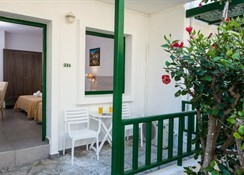 It is just beach just 3km from the lively resort of Hersonissos. Analipsi is a fine beach favoured by families due to its shallow beach. But there can be waves hitting the beach in summer. Overall the resort is less crowded and has a laidback vibe. There is a church dedicated to Agia Marina. To the west of it there’s a small habour and a fine little beach. The main sandy beach of Analipsis is on the other side of the chapel. There are several accommodation types, ranging from rooms to apartments and bungalows to suit the need and taste of guests. Stella Village has a Standard, Superior or a Family room, to cater to guests’ needs. The bright and spacious rooms have excellent sea, mountain, and garden views and come with a wooden accent and furniture. 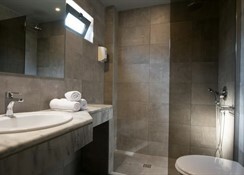 These come with air-conditioning, fridge, safe deposit boxes, satellite TV and en-suite bathrooms with bath amenities. Rooms feature furnished balconies that overlook the garden and provide magnificent views. The nearest airfield, Herkalion International Airport is about 20km away. Stella Village has a buffet restaurant that serves meat, fish and vegetarian dishes. This restaurant also organizes weekly special theme nights. The Elia Restaurant serves up delicious Mediterranean and international cuisine. There are two pool bars that serves coffee, refreshments and drinks accompanied by live music. Stella Village has two swimming pool for adults and kids each and terrace besides access to the private beach. 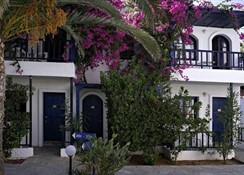 Guests could walk down to Hersonnissos which has good bars and cafes and shops. There is a lovely spa with steam room offering massages and therapies. Tiny tots can have fun at Kid’s Club or Playground. The hotel has facilities for Games Room, Table Tennis, Tennis and Billiards. The hotel arranges water aerobics sessions, a football pitch and beach volleyball facilities. Guests can also shop at the shops on-site. There is lively evening entertainment too. The kids loved it. Great family break. Unfortunately we all were very ill on and after our return trip as our son picked up something on the final day. Perhaps suggests the hotel was not as clean as it could have been; or otherwise picked up from the private beach?